Our state constitution protects our pensions, our right to organize and collectively bargain, wages, contracts, civil service appointments, civil rights and so much more. 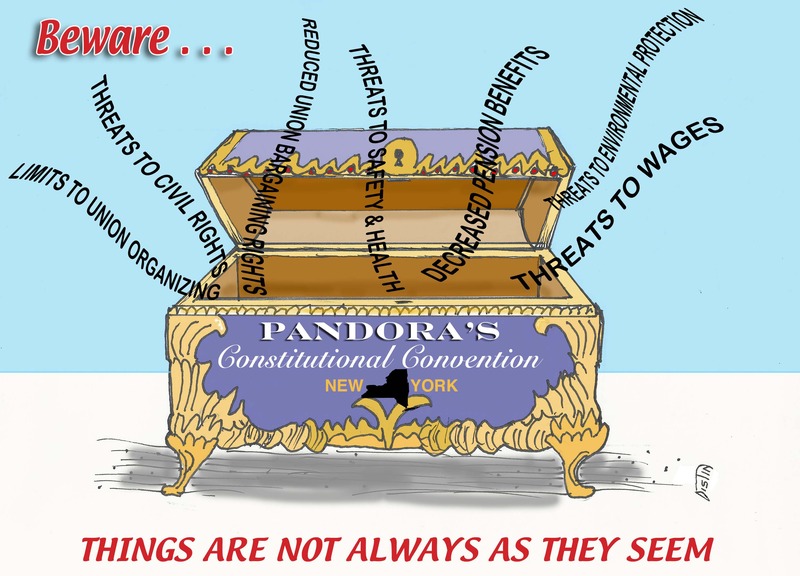 A state constitutional convention could put all of these protections in jeopardy. On Nov. 7, New York state voters will decide whether to hold a state Constitutional Convention. The New York State Constitution mandates that every 20 years, voters must decide whether to approve a convention. A state Constitutional Convention is a meeting of 204 delegates — three delegates from each of the state’s 63 Senate districts, plus 15 at-large delegates. 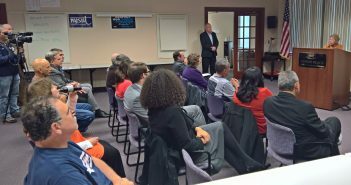 During this meeting, delegates would have the ability to amend any part of the state’s constitution. A convention could result in minor revisions to the constitution, or major changes. Any changes agreed to by a majority of delegates will then go to the voters for approval. Any approved changes will then become part of the state constitution. In 1997, voters rejected a convention largely based on strong opposition from CSEA and our allies. In recent years, some elected officials, voters and interest groups have expressed support for holding a constitutional convention because of frustration with recent political scandal and misguided state policies. We are again strongly opposed to a convention. Here’s an example of why we can’t afford to open the door to changing the state constitution in this manner. This means that once a pension benefit is earned, it can’t be taken away. This is also the reasoning behind the state’s six pension tiers; while each tier reduces pension benefits for new members, the pension benefits for people already in the state retirement system can’t be reduced or eliminated. Many people hold the misguided view that our pensions are too generous, and a constitutional convention could make changes that jeopardize our pensions. A convention would also be expensive; it would likely be controlled by special interests that want to reduce your protections and could cost taxpayers millions. Each delegate would receive the salary of a state legislator (at least $79,000), get to hire their own staff and receive pension credits. They also get to set their own rules, and there is no time limit on the length of a convention. Even after the convention, voters could potentially reject any constitutional changes, making it a waste of time and money. 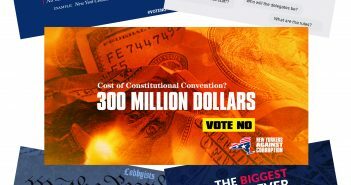 Vote ‘no’ on the convention, and urge your family, friends and co-workers to also do so. Share this information widely. Become a PEOPLE member. Reach out to your state legislators to tell them that there are other ways to fix problems in New York. Learn more at cseany.org/stopthecon. Janice Gavin is the editor of The Work Force and CSEA’s special interest publications, Essentially Women, Retiree News and Canary. A graduate of SUNY Plattsburgh and Syracuse University, Gavin has been a journalist and public relations professional for more than 20 years. She worked as a newspaper reporter and bureau chief at the Plattsburgh Press-Republican, where she was honored with Associated Press and New York Newspaper Publishers Association awards. Gavin joined CSEA as a communications specialist in the union's Southern Region in 2000. In 2004, she became The Work Force's associate editor, a position she held until becoming the publication's editor in 2017. Growing up in a union household, she is dedicated to improving workers’ lives through telling their stories. Great article! Maybe we should have more about how to get this information out to everyone, so we don’t end up like Wisconsin.